Put your piece of cardboard inside of your shopper to prevent any paint from seeping through to the other side. 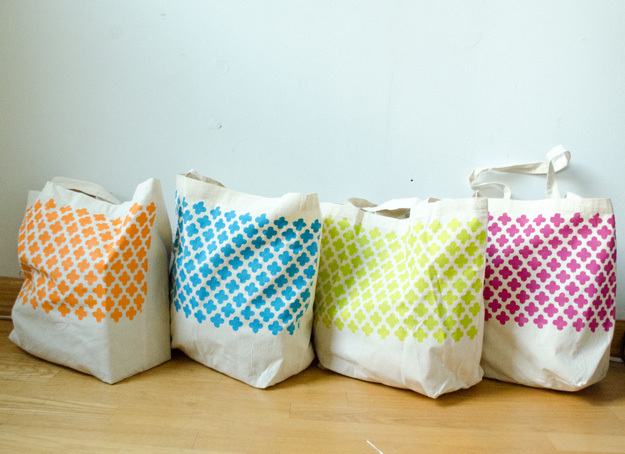 Place your stencil towards the top of your shopper (I had my stencil overlapping a bit off the edge). Begin painting over your stencil, filling in your entire pattern. Once you have filled in your entire stencil, move it to the right. You will place your stencil over some of the crosses you already painted to ensure your pattern is straight. Let your paint dry and you are all set. Easy peasy!